Plus, ‘Late Night with Seth Meyers’ expands. Mon, April 15: Guests include Cher and musical guest Cher and The Cher Show cast. Tue, April 16: Guests include Alex Rodriguez, Ashley Benson and musical guest Jade Bird. Wed, April 17: Guests include Kate Beckinsale, Ralph Macchio, and Rudy Francisco. Thu, April 18: Guests include Andy Cohen, Mario, Michael & Marco Andretti and José Andrés. Mon, April 15: Guest Taylor Schilling is an Emmy-nominated actress known for her role in "Orange is the New Black." Her new film “Family” hits theaters on April 19. Tue, April 16: Guest Taylor Tomlinson made her late night stand-up debut on CONAN in 2017. Her Netflix special, "The Comedy Lineup," is available now. Wed, April 17: Guest Jim Jefferies is a comedian, actor, and writer. He hosts "The Jim Jefferies Show," which airs Tuesdays at 10:30pm on Comedy Central. Thu, April 18: Guest Bill Hader is the co-creator and Emmy-winning star of the HBO series "Barry"
Mon, April 15: Guests Tracy Morgan, Willie Geist and musical guest Ingrid Andress. Tue, April 16: Guests Julia Louis-Dreyfus. Mark Hamill and Artist Ashley Longshore. Wed, April 17: Guests Hank Azaria, Melissa Fumero and Brandon Maxwell. Thu, April 18: Special 90-minute episode to give context to the redacted version of the Mueller report becoming public earlier in the day. 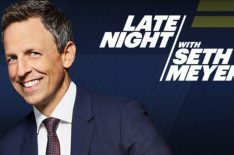 In analyzing the Mueller report in “Late Night’s” unique way, the show will feature Meyers’ popular “A Closer Look” segment. In addition, “Saturday Night Live” cast member Leslie Jones will join Meyers for “Game of Jones” as the two watch and discuss the latest episode of “Game of Thrones” together. Fri, April 19: Guests Senator Kamala Harris, Henry Winkler and Conleth Hill. Aaron Comess sits-in with the 8G Band. Mon, April 15: Guests include Rachel Taylor with musical guest Morgxn and guest Ami Ameen. Tue, April 16: Guests include Pablo Schreiber with musical guest Robert Delong and guest Madeline Brewer. Wed, April 17: Guests include Machine Gun Kelly with musical guest Parquet Courts and guest Karley Sciortino. Thu, April 18: Guests include Henry Rollins with musical guest Snail Mail and guest Sarah Grey. Fri, April 19: Guests include Tom Green with musical guest Shaed and guest Lyric Lewis. Mon, April 15: ANDY COHEN joins Kelly as co-host this morning. ED HELMS talks about the Disneynature documentary “Penguins,” and ATO ESSANDOH speaks about the series “The Code.” Plus, every day this week, “Live” will feature a special preview of the 2019 New York International Auto Show with “Live’s New York Auto Show Week.” Today kicks off with “fun and fast” cars. Thu, April 18: The hosts welcome “The Neighborhood” star BETH BEHRS, and JAMES BROLIN chats about the series “Life in Pieces.” Plus, “Live’s New York Auto Show Week” continues with a spotlight on this year’s hottest SUVs and crossovers. Fri, April 19: “Billions” star ASIA KATE DILLON drops by, and “Live’s New York Auto Show Week” wraps up with a look at “rugged yet refined” cars. A&E’s 60 Days In (Thursdays 10/9c) goes inside Atlanta’s Fulton County Jail, one of the most dangerous facilities in the country, where everyday people go undercover posing as inmates. This season, one of the participants goes “full inmate,” blowing their cover and turning the entire program on its head. Faced with rampant drug problems, a powerful gang population and the constant threat of violence, this is one wild look inside prison walls.